Home / News / Opinion / Sonza to 'Ang Probinsyano': "Tama si Chief Albayalde, Dapat Managot ang mga Lumalapastangan sa Gobyerno"
Sonza to 'Ang Probinsyano': "Tama si Chief Albayalde, Dapat Managot ang mga Lumalapastangan sa Gobyerno"
Veteran broadcaster and former TV host, Jay Sonza, once again took to social media to impart an extremely striking insight about the ongoing disputable disclosure and statement of Philippine National Police (PNP) chief Director General Oscar Albayalde who allegedly is intending to meet with the people behind the action-packed hit series ‘Ang Probinsyano’ over what the latter depicts as an observable bad portrayal of policemen. On Wednesday, November 14, 2018, the PNP chief calls out and protests that other people are already reacting through the message system of the PNP in the social media and other communication platforms about the portrayal of the Chief PNP as a villain in the said TV series of ABS-CBN. “Masyadong hindi na pangkaraniwan na nangyayari and it gives us a bad impression actually. 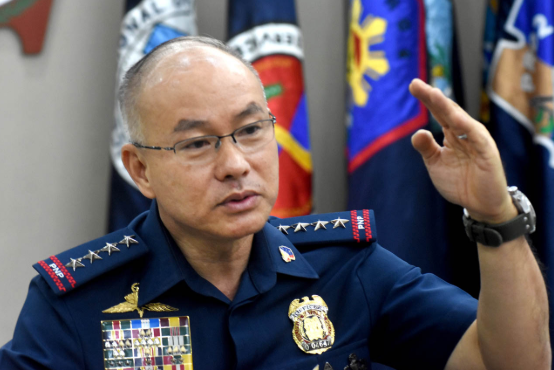 It’s a bit unfair sa PNP when you portray yung mga ganung activity that doesn’t really happen sa organization naming,” said General Albayalde. He likewise said that it is already aggravating that people see justice very imperative while as per him, it is actually not, hence, he added that they are a country of laws and not of men. “It’s very disturbing and para kasing ang nakikita ng mga tao na parang instant yung justice, parang it’s okay. It’s not. We are a nation of laws not of men,” the PNP Chief added. 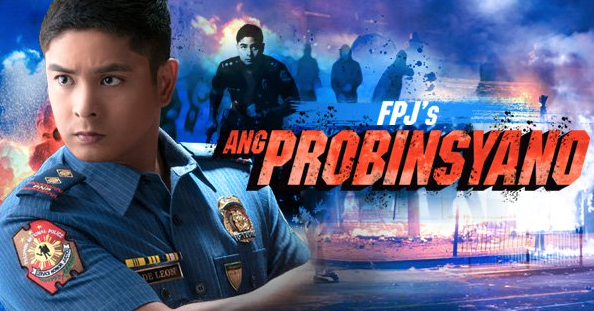 Albayalde as well said that PNP leadership needs to clear things up with the production outfit of 'Ang Probinsyano', that is why he had just consulted the arrangement with Interior Secretary Eduardo Año, and has officially sent a letter to the MTRCB. “We will be writing both the production outfit and the MTRCB (Movie and Television Review Classification Board). We want to probably have an audience and probably kung hindi man nila matigil yun e mabago man lang yung pagpoportray sa PNP,” Gen. Albayalde stated. 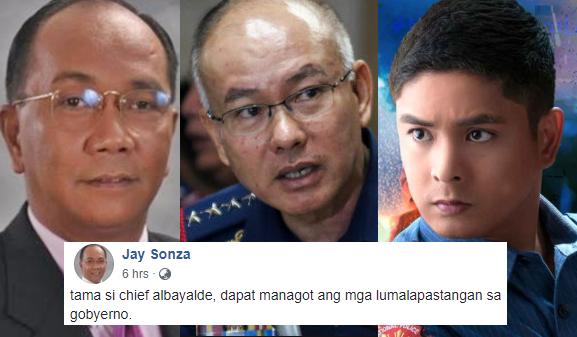 With that being said, Jay Sonza, who is patent for being fearless in speaking his mind over various national and political issues, strikes his own remarkable opinion regarding the issue and backs up PNP Chief Albayalde on the latter's decision to clear things up with the TV series. The veteran journo similarly said that whoever offends the government, should be responsible and accounted for. "tama si chief albayalde, dapat managot ang mga lumalapastangan sa gobyerno. ", Sonza wrote. More so, Sonza said that ABS-CBN can not allegedly substantiate that the said TV Program is just a flight of fancy and fiction, considering that they actually use police uniforms, patrol cars, logos or seals, establishing shots of Camp Crame, the national headquarters of the PNP and The Criminal Investigation and Detection Group (CIDG), PNP's primary investigation arm. "hindi maaring ikatwiran ng abs-cbn na kathang isip lang ang promdi tV program. gumagamit sila ng police uniform, patrol cars, logo or seal, establishing shot ng crame at cigd, salitang PNP at iba pa.", the former TV host said. Sonza at that point gives the network a solid suggestion, saying that the program should change their costume design and dialogue to give respect to our national police, or else, as per the veteran journo, the Movie and Television Review and Classification Board (MTRCB) ought to inflict punishment against the network. "kung magpapalusot sila, baguhin nila ang costume design and dialogue with respect to our national police." "otherwise, mtrcb should impose sanction against the network. ", he ended. "hindi maaring ikatwiran ng abs-cbn na kathang isip lang ang promdi tV program. gumagamit sila ng police uniform, patrol cars, logo or seal, establishing shot ng crame at cigd, salitang PNP at iba pa.
tama si chief albayalde, dapat managot ang mga lumalapastangan sa gobyerno. kung magpapalusot sila, baguhin nila ang costume design and dialogue with respect to our national police. otherwise, mtrcb should impose sanction against the network."